This stamping nail polish is a polish designed specially for stamping which comes in a small cardboard box. 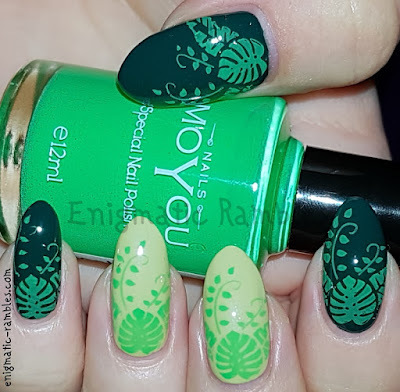 "Create designs inspired by nature with the bright Atlantic Green stamping nail polish. 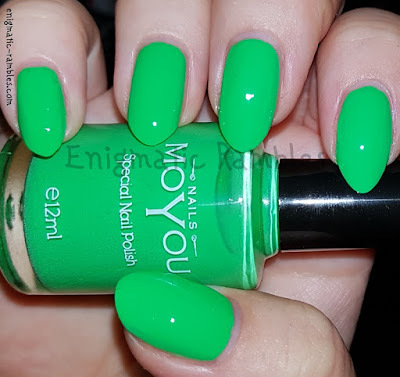 If you enjoy the vivid green colours, this nail polish will spice up your nails and will make your nail art look as fresh as the grass in springtime." Atlantic Green is a neon green shade which dries to a semi matte finish. 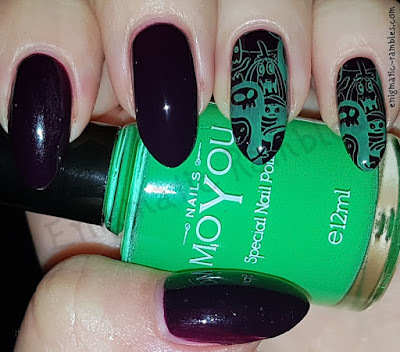 MoYou say it is great for spring and summer nails, which I would agree with along with Halloween nails. The brush is flattened and wide. 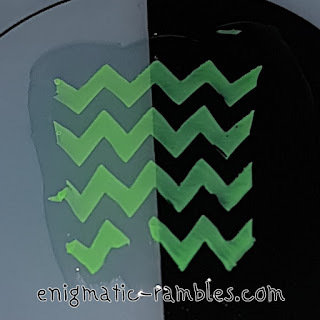 I used this on the MoYou stamping mat to show it over a dark base as well as a light base and as you can see it does cover both lighter bases as well as a darker base.